Solar Photovoltaic (PV) is a technology that converts sunlight (solar radiation) into direct current electricity by using semiconductors. When the sun hits the semiconductor within the PV cell, electrons are freed and form an electric current. 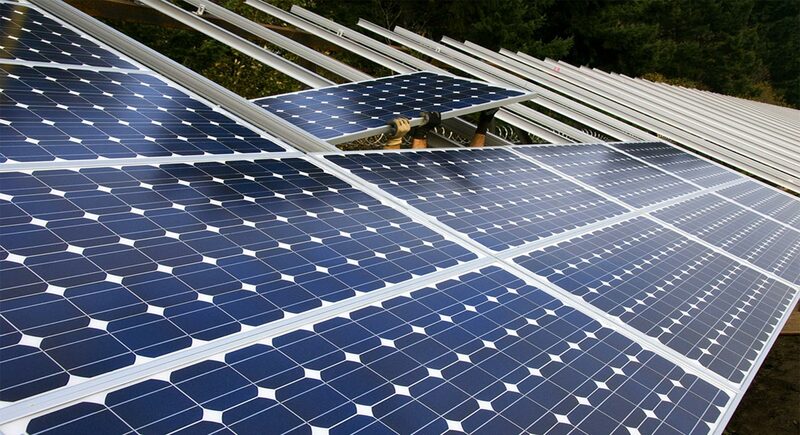 Solar PV technology is generally employed on a panel (hence solar panels). PV cells are typically found connected to each other and mounted on a frame called a module. Multiple modules can be wired together to form an array, which can be scaled up or down to produce the amount of power needed. PV cells can be made from various semi-conductor materials. The most commonly used material today is silicon but other materials, such the ones listed below, are being tested and used to increase the efficiency of converting sunlight to electricity. Almost 90% of the world’s PV technologies, today, are based on some variation of silicon IPCC. (2011). IPCC Special Report on Renewable Energy Sources and Climate Change Mitigation. Prepared by Working Group III of the Intergovernmental Panel on Climate Change [O. Edenhofer, R. Pichs-Madruga, Y. Sokona, K. Seyboth, P. Matschoss, S. Kadner, T. Zwickel, P. Eickemeier, G. Hansen, S. Schlömer, C. von Stechow (eds)]. Cambridge, United Kingdom and New York, NY, USA: Cambridge University Press. IPCC. (2011). IPCC Special Report on Renewable Energy Sources and Climate Change Mitigation. Prepared by Working Group III of the Intergovernmental Panel on Climate Change [O. Edenhofer, R. Pichs-Madruga, Y. Sokona, K. Seyboth, P. Matschoss, S. Kadner, T. Zwickel, P. Eickemeier, G. Hansen, S. Schlömer, C. von Stechow (eds)]. Cambridge, United Kingdom and New York, NY, USA: Cambridge University Press. IPCC. (2011). IPCC Special Report on Renewable Energy Sources and Climate Change Mitigation. Prepared by Working Group III of the Intergovernmental Panel on Climate Change [O. Edenhofer, R. Pichs-Madruga, Y. Sokona, K. Seyboth, P. Matschoss, S. Kadner, T. Zwickel, P. Eickemeier, G. Hansen, S. Schlömer, C. von Stechow (eds)]. Cambridge, United Kingdom and New York, NY, USA: Cambridge University Press. IPCC. (2011). IPCC Special Report on Renewable Energy Sources and Climate Change Mitigation. Prepared by Working Group III of the Intergovernmental Panel on Climate Change [O. Edenhofer, R. Pichs-Madruga, Y. Sokona, K. Seyboth, P. Matschoss, S. Kadner, T. Zwickel, P. Eickemeier, G. Hansen, S. Schlömer, C. von Stechow (eds)]. Cambridge, United Kingdom and New York, NY, USA: Cambridge University Press. IPCC. (2011). IPCC Special Report on Renewable Energy Sources and Climate Change Mitigation. Prepared by Working Group III of the Intergovernmental Panel on Climate Change [O. Edenhofer, R. Pichs-Madruga, Y. Sokona, K. Seyboth, P. Matschoss, S. Kadner, T. Zwickel, P. Eickemeier, G. Hansen, S. Schlömer, C. von Stechow (eds)]. Cambridge, United Kingdom and New York, NY, USA: Cambridge University Press. IPCC. (2011). IPCC Special Report on Renewable Energy Sources and Climate Change Mitigation. Prepared by Working Group III of the Intergovernmental Panel on Climate Change [O. Edenhofer, R. Pichs-Madruga, Y. Sokona, K. Seyboth, P. Matschoss, S. Kadner, T. Zwickel, P. Eickemeier, G. Hansen, S. Schlömer, C. von Stechow (eds)]. Cambridge, United Kingdom and New York, NY, USA: Cambridge University Press. . In 2011, about 95% of all shipments by U.S. manufacturers to the residential sector were crystalline silicon solar panels US Department of Energy. (2012, 02 29). U.S. Department of Energy. Retrieved from SunShot Initiative: http://www1.eere.energy.gov/solar/sunshot/vision_study.html US Department of Energy. (2012, 02 29). U.S. Department of Energy. Retrieved from SunShot Initiative: http://www1.eere.energy.gov/solar/sunshot/vision_study.html US Department of Energy. (2012, 02 29). U.S. Department of Energy. Retrieved from SunShot Initiative: http://www1.eere.energy.gov/solar/sunshot/vision_study.html US Department of Energy. (2012, 02 29). U.S. Department of Energy. Retrieved from SunShot Initiative: http://www1.eere.energy.gov/solar/sunshot/vision_study.html US Department of Energy. (2012, 02 29). U.S. Department of Energy. Retrieved from SunShot Initiative: http://www1.eere.energy.gov/solar/sunshot/vision_study.html US Department of Energy. (2012, 02 29). U.S. Department of Energy. Retrieved from SunShot Initiative: http://www1.eere.energy.gov/solar/sunshot/vision_study.html . The major difference between the technologies is the material used to generate electricity out of sunlight. Each type of material has different attributes, resulting in different applications and efficiencies. In general the efficiency of solar PV technologies varies, ranging between 6-18% at the moment. Unlike solar thermal technologies, solar PV relies on sunlight, which means that when the sun does not shine electricity is not produced. One important advantage of solar PV is it that utilizes the most abundant renewable energy resource on the planet, the sun. Estimates show that there is 10,000x more solar energy coming to the Earth’s surface than global annual fossil fuel demand Chandler, David. “Vast amounts of solar energy radiate to the Earth, but tapping it cost-effectively remains a challenge”. Phys.org. October 2011. http://phys.org/news/2011-10-vast-amounts-solar-energy-earth.html#jCp Chandler, David. “Vast amounts of solar energy radiate to the Earth, but tapping it cost-effectively remains a challenge”. Phys.org. October 2011. http://phys.org/news/2011-10-vast-amounts-solar-energy-earth.html#jCp Chandler, David. “Vast amounts of solar energy radiate to the Earth, but tapping it cost-effectively remains a challenge”. Phys.org. October 2011. http://phys.org/news/2011-10-vast-amounts-solar-energy-earth.html#jCp Chandler, David. “Vast amounts of solar energy radiate to the Earth, but tapping it cost-effectively remains a challenge”. Phys.org. October 2011. http://phys.org/news/2011-10-vast-amounts-solar-energy-earth.html#jCp Chandler, David. “Vast amounts of solar energy radiate to the Earth, but tapping it cost-effectively remains a challenge”. Phys.org. October 2011. http://phys.org/news/2011-10-vast-amounts-solar-energy-earth.html#jCp Chandler, David. “Vast amounts of solar energy radiate to the Earth, but tapping it cost-effectively remains a challenge”. Phys.org. October 2011. http://phys.org/news/2011-10-vast-amounts-solar-energy-earth.html#jCp . Another advantage of solar PV’s is that it transitions electricity generation from large, centralized facilities to smaller, decentralized production sites (ie. residential rooftops). This turns former energy consumers into so-called “prosumers," people that can produce and consume their own electricity. Traditionally, concerns about solar PV were about cost, intermittency and efficiency, but large-scale implementation and rapid cost decline SolarServer. (2013). SolarServer. Retrieved from Indian SREC demand - prices fall in May 2013: http://www.solarserver.com/solar-magazine/solar-news/current/2013/kw23/indian-srec-demand-prices-fall-in-may-2013.html SolarServer. (2013). SolarServer. Retrieved from Indian SREC demand - prices fall in May 2013: http://www.solarserver.com/solar-magazine/solar-news/current/2013/kw23/indian-srec-demand-prices-fall-in-may-2013.html SolarServer. (2013). SolarServer. Retrieved from Indian SREC demand - prices fall in May 2013: http://www.solarserver.com/solar-magazine/solar-news/current/2013/kw23/indian-srec-demand-prices-fall-in-may-2013.html SolarServer. (2013). SolarServer. Retrieved from Indian SREC demand - prices fall in May 2013: http://www.solarserver.com/solar-magazine/solar-news/current/2013/kw23/indian-srec-demand-prices-fall-in-may-2013.html SolarServer. (2013). SolarServer. Retrieved from Indian SREC demand - prices fall in May 2013: http://www.solarserver.com/solar-magazine/solar-news/current/2013/kw23/indian-srec-demand-prices-fall-in-may-2013.html SolarServer. (2013). SolarServer. Retrieved from Indian SREC demand - prices fall in May 2013: http://www.solarserver.com/solar-magazine/solar-news/current/2013/kw23/indian-srec-demand-prices-fall-in-may-2013.html in places like Germany and USA have revealed more complex issues such as grid compatibility, lack of solar industry expertise, and the use of rare and precious metals that make up the cells. ^ IPCC. (2011). IPCC Special Report on Renewable Energy Sources and Climate Change Mitigation. Prepared by Working Group III of the Intergovernmental Panel on Climate Change [O. Edenhofer, R. Pichs-Madruga, Y. Sokona, K. Seyboth, P. Matschoss, S. Kadner, T. Zwickel, P. Eickemeier, G. Hansen, S. Schlömer, C. von Stechow (eds)]. Cambridge, United Kingdom and New York, NY, USA: Cambridge University Press. Center for Alternative Energy UK – What is the environmental impact of PV solar panels? National Geographic – How Green Are Those Solar Panels, Really?